Bacteriostatic water for injections is used for pharmaceutical products intended for use in liquid form. One ml of such water contains 0,9% of benzyl alcohol and the same percentage of sodium chloride. Bacteriostatic water 10 ml is the most popular and accessible package. 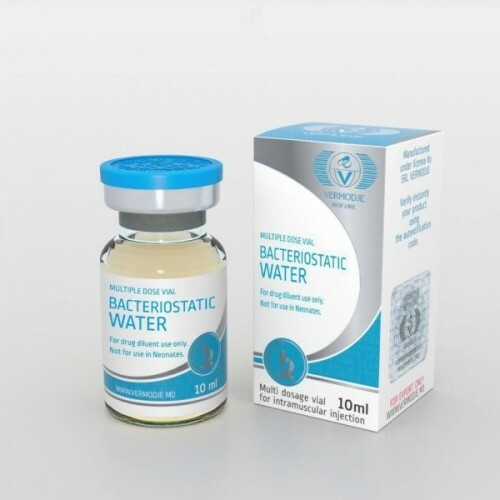 Sterile bacteriostatic water is used in healthcare and various sports to prepare injection and infusion solutions. In bodybuilding it is usually used for administration of pharmaceutical products including peptides. It allows to dissolve active components that are often in a form of powder in the most effective way. Another undisputed advantage consists in safety of injections that are often made in non-sterile environment. The most often use of bacteriostatic water is for HGH injections. Although there are many analogs (normal saline, sterile water, etc.) bacteriostatic water has some exclusive features. First of all, it contains benzyl alcohol, which is capable of destroying all known types of bacteria. When piercing a vial with a syringe you can easily infect the contents with bacteria that would grow quickly in pure sterile water. It’s obvious that making injections with bacteria is extremely dangerous for health and can cause unpredictable effects. Comes in 10 ml multidose vials. Each vial contains 9 mg per ml. Each product of Vermodje has authentication code.